I do what I can to eat Vermont comprehensively. But sometimes, even a landmark gets lost in the shuffle. 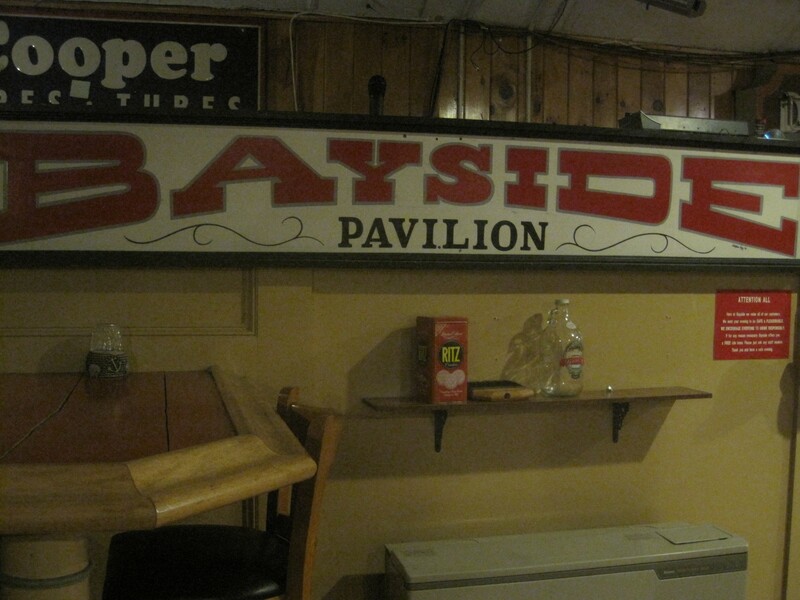 Opened as Barker's Restaurant in 1921, Bayside Pavilion in St. Albans is just such a place. The old-school roadhouse overlooks St. Albans Bay, but I was also hoping to catch another view — one of the stripper poles described in a 2009 article in Seven Days. But I was thwarted. According to a staffer, the poles came down two years ago. I was also stymied a bit in my ordering. When the spot opened as Bayside Pavilion in the 1980s, it became a destination for barbecue, at least according to a history written on the front of the menu. But by the time I got to dinner, around 8 p.m., ribs were sold out. So for a meaty replacement, I ordered the bacon-Gorgonzola-stuffed burger. There aren't many Juicy Lucys in the Green Mountains. I was excited for a burger oozing with cheese and bacon. Instead, I got this. Not exactly my definition of 'stuffed.' All the same, it was a good burger. Though cooked more than the medium I requested, the beef was seasoned appropriately. 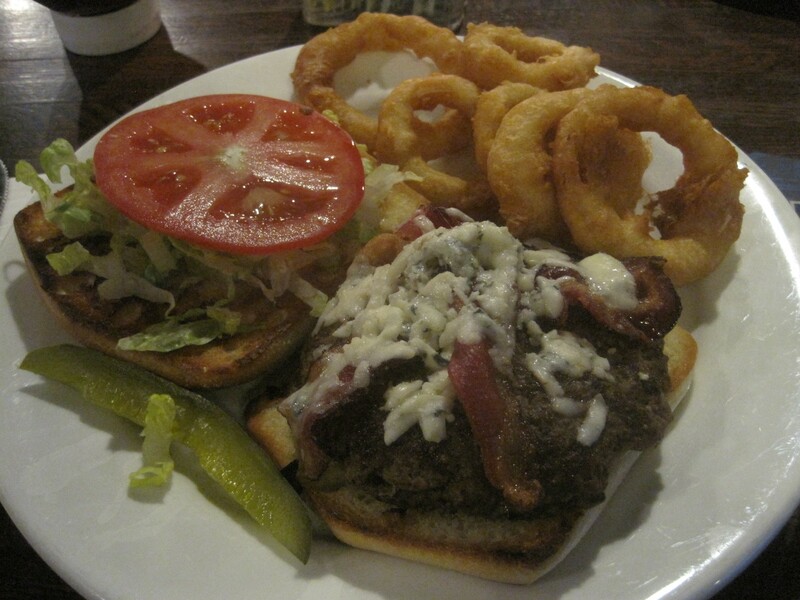 The combination of nicely crisped bacon and melty blue cheese paired wonderfully with the beef and toasted ciabatta bun. If I was missing ooze from my burger, I got it from the onion rings. That's not a knock. The thick beer batter burst with oil each time I bit into a soft-centered ring. If I have a craving for fair food in the winter, I now know where to go. The only issue was a $2 upcharge, of which my server neglected to inform me. She thought it was explained on the menu. It's not. In the future, I'll know that the $10.95 price tag only applies with a side of chips. But the rings are worth it. 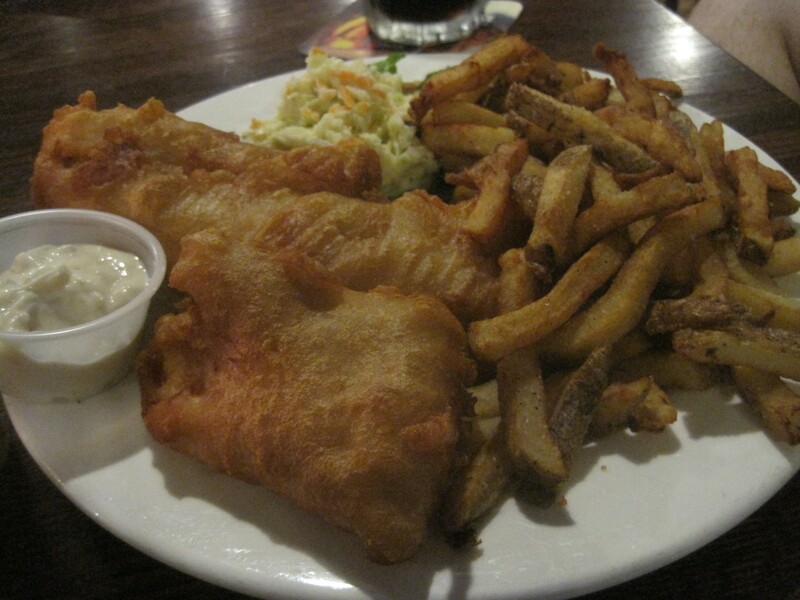 The same boozy batter also coated a pair of haddock filets. Their cover was thick but not bready. This was due in part to a cook so thorough that it left the fish slightly dry, despite its cloak of oil. Floppy fries didn't impress me, but I was happy to crunch through a pile of lightly tangy coleslaw instead. Some desserts were not homemade, our waitress admitted. A few others were. Between the apple crisp and brownie sundae, we naturally veered toward chocolate. My dining partner quickly dispatched the sweet, though he agreed that the brownie tasted suspiciously like the Duncan Hines mix on which he'd been reared. 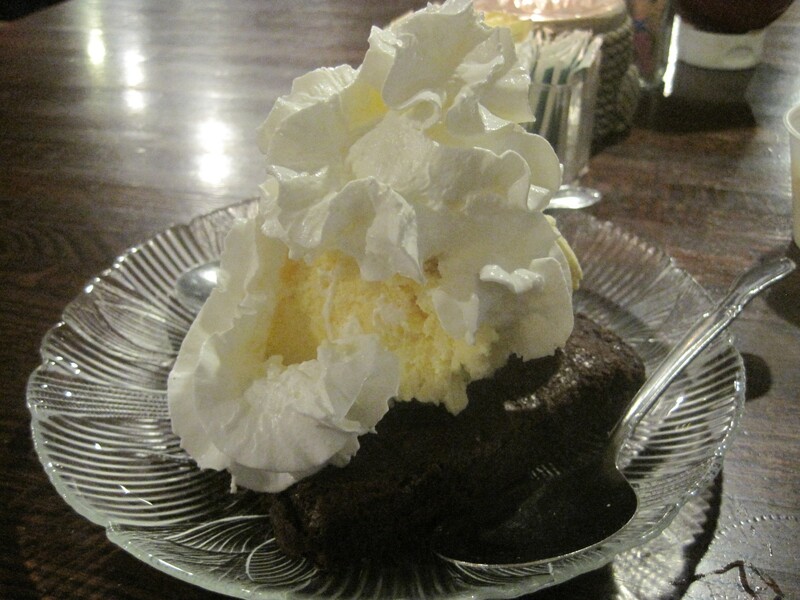 Perhaps it was the warmth of the brownie melting the vanilla ice cream on top that so appealed to him. I simply can't recommend a brownie sundae that doesn't include hot fudge sauce. It felt naked. I can't claim to be surprised that I didn't experience any culinary thrills at Bayside Pavilion. But I enjoyed the experience. As I ate, I imagined that I was tasting the history of the 93-year-old building. 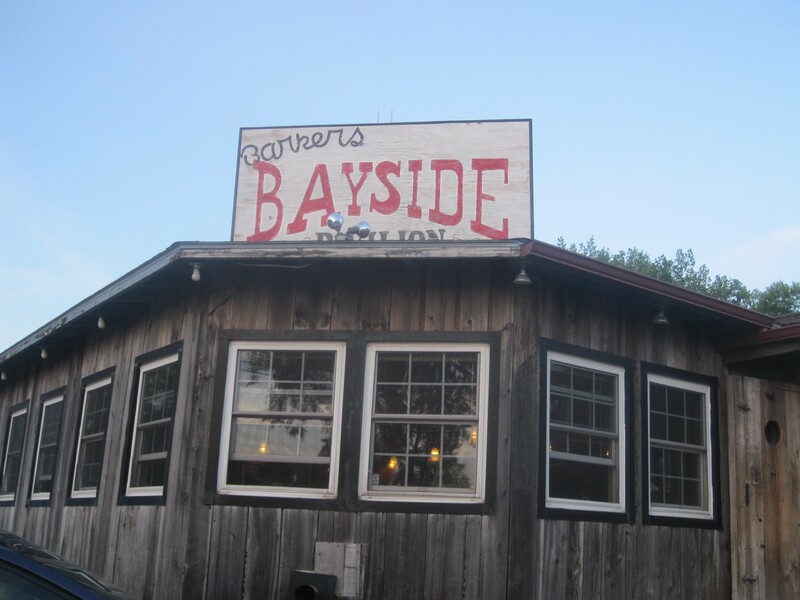 It may not have been the best fish-and-chips or burger I'd ever had, but I could imagine waterside diners digging in back in the early days of Barker's Restaurant.